of what the breed is all about. Royal Seal died in 1988 aged 15 years. before him. Tosha was Top Dog, all breeds, for two consecutive years. pedigree of many of today's Yorkies. as currently adopted in Australia. Tail: Preferably docked to medium length with plenty of hair, darker blue in colour than rest of body, especially at the end of tail. Carried a little higher than level of back. Coat: Hair on body moderately long, perfectly straight (not wavy), glossy; fine silky texture, not woolly. Fall on head long, rich golden tan, deeper in colour at sides of head, about ear roots and on muzzle where it should be very long. Tan on head not to extend on to neck, nor must any sooty or dark hair intermingle with any of tan. What is 'Excellence' in a Breed? Is it simply conforming externally to the breed standard? Is it being both beautifully structured and healthy? Is it being beautifully structured, healthy and temperamentally sound? is so dysplastic at age 3 that it is crippled, is that excellence? is diseased and dies at age 5, is that excellence? so foul tempered that it is impossible to live with, is that excellence? some other cosmetic fault? Is that excellence? How does one achieve excellence in breeding? It seems that a lot of judges and breeders are ignoring some key points in the breed standards. The result is a shift towards cookie cutter dogs and generic movement. 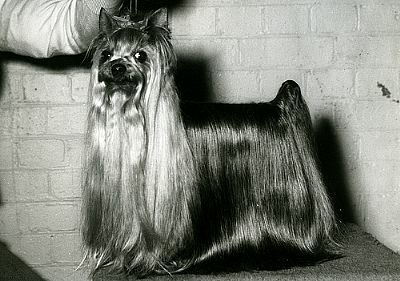 When breed standards were initially written there was a point system that prioritized attributes for individual breeds. In most breeds, this valuable tool was removed. That left judging the breed up to the discerning “eye” of a breeder or judge which in truth, allowed importance to be placed upon virtues which the Breed Standard never intended. Some say the era of large kennels has passed, however, there ARE breeders today breeding quality, correct dogs with a minimum of well chosen individuals in their possession. These breeders continue to adhere to the breed standard and are continuously beaten in the ring by judges who, in their short span in the sport, have never seen the greats. Or if they have seen them, they don’t have the courage to pull one forward when it enters their ring. With wonderful educational opportunities, access to parent club breed standards and assistance for new judges to move forward, our sport is regressing at an alarming rate. Why? That is something we must all address and decide for ourselves. Do we want to move forward in the sport of dogs and leave something for future generations, or do we simply want to have a fun day with our dog? Demanding judges to be educated based on pieces of the breed standard hasn’t worked. Somewhere along the way, this “breed seminar” and “judges education” idea took on a life of its own. Despite AKC efforts to improve judging, it seems each step added another obstacle. Someone asked Dale Carnegie what it took to be successful. He answered.” I don’t know how to tell you to become successful. I can tell you how to fail. Try to please everyone." Is that what we’re doing in both breeding and judging seminars? Perhaps we need to study and apply the entire breed standard! Why are judges shown only outstanding individuals at breed seminars? Being involved in dogs, horses, goats, rabbits, and various other critters, I swear one learns more from the bad ones. How can one compare virtues unless they see them alongside breed faults? The easiest way to learn structure is a direct comparison of “bad” and good, yet rarely is structure considered during judging seminars. It is assumed that by the time one reaches that level, judges know all about structure but if that’s the case, why are they there? Judges attempt to follow a written breed standard. So why remove the point systems from the breed standards? Why, to make it easier for judges. Why do we have judge's education? Because exhibitors and breeders want judges to become better educated and thus make better choices. Despite breed seminars and the AKC Institutes and materials, do we have better judges? If we no longer judge breeding stock by the breed standard, what is the point? How does one learn to judge a dog when several dogs are shown as examples and the student is told on the first dog “this is the desired eye, the second dog has the preferred head, the third dog offers coat characteristics, the fourth dog has the desired proper foot, and the fifth dog offers ear set, and so on? THEN a judge is expected to evaluate the dog in its entirety? This is what it means to “have an eye” for a dog. It isn’t something one can grow. It is the ability to absorb the different virtues, then go into the ring and select the animal based on symmetry and let it “fill the eye.” while prioritizing the breed standard’s listed virtues in order or priority. When the eye is drawn to any specific part of a dog, be it rear, head, ears, coat, or foot, usually it is because it is exaggerated and therefore, incorrect. Examples are floppy flews on Great Danes, dogs with over angulated rears, straight fronts, and overdone coats. Yet, often this is the very thing the piece-judge “beads in on” due to breed seminar education. The goal is to find an animal that reflects a balance of type and soundness. Is it any wonder breeds are in a constant state of flux regarding “type”? Of course, we can be generous and say breed standards are open to the interpretation of each individual, but the fact remains, if breeders don’t breed to a specific blueprint, what is the point of breeding at all? Have we forgotten that the initial reason for our sport was to gather and select dogs that most represented our written breed standards? Fact: “Type change is when an obvious fault becomes so concentrated it eventually appears to be accepted as a virtue”. Rather than taking up the challenge of breeding (or judging) to the breed standard, it’s easier to flood the ring with the latest fad, thus making the “correct to the breed standard” dog look out of place. “I can do what I want” seems to take precedence in today's world but when dogs are judged in pieces and the breed standard places no emphasis, people will breed for what wins rather than what is correct. That is, until the next big thing surfaces. Changing the rules to fit the game has not improved our sport.